1.It is indeed a happy occasion for me to be present amidst you on the International Day of Older Persons. It is my privilege to honour, through the "Vayoshreshtha Samman”, individuals and institutions who have rendered outstanding services to the cause of the elderly. 2.The International Day of Older Persons is an occasion to focus renewed attention on issues relating to the older people. In India, the life expectancy of people has gradually risen over the years. From 59 years in 1990, the life expectancy at birth has increased to 66 years in 2013. World over, the population of the aged is increasing. India is no exception. Though India has the largest number of the young in the world, but still there is a sizeable population of older persons as well. According to the 2011 Census, population in the 60 plus age bracket comprised 8.6 percent of the country’s total population which can be considered as elderly. The phenomenon of age dependency will strengthen in the years to come. This will give rise to a host of issues which needs to be dealt in a more comprehensive manner and with a greater sense of urgency. Older persons cannot wait indefinitely as time is also running out for them. 3.The problems relating to old age are not experienced nor fully comprehended by the younger generation. There is a need to sensitize various strata of the society towards the challenges being faced by the elderly people. Social isolation, neglect, and lack of love, care and emotional support are the major deprivations generally faced by the older people. The younger generation must be willing to give more respect, love and care to the elderly, not only in their own family but also in the society at large. There is need to strengthen social bonding between the generations. 4.The elderly face a plethora of physical problems, including reduced physical strength, decreased immunity, aggravation in ailments already present, onset of sensory and motor disabilities, weakened memory and decrease in intellectual prowess. Combination of adverse health conditions such as these can have serious implications on the physical, emotional and economic well-being of our senior citizens. If an elderly person is unable to secure specialized medical care due to lack of affordability or accessibility, it will compound the hardships already being faced by him or her. It is important that institutions to provide geriatric care be established, strengthened and made more affordable for the common man. 5.The Indian tradition of respecting and caring for elders has been passed on from generations. They are considered as the most valuable part of the family. We must not let this socio-cultural asset of ours wither away. The societal transformation from joint to nuclear families notwithstanding, we must encourage in the younger lot the ability and keenness to facilitate ageing in their own homes. To realize this, the availability of geriatric care givers at affordable cost must be ensured. Institutions to provide training and skill acquisition in this field must be established in States where their deficiency or absence exists. Young people must be sensitized to acquire necessary skill and training. This would ensure that the ability of nuclear families to take proper care of senior citizens is not impeded by shortage of trained geriatric care givers. 6.Facilities to provide institutional care to needy elderly persons must be established in sufficient numbers. States and local bodies must take the lead in ensuring that adequate mechanism to provide institutional care to the aged is available within the reach of the needy. The voluntary sector as well as the corporate sector must also be encouraged to set up institutional care centres to make available comprehensive care including geriatric healthcare facilities to the inmates. 7.There are legislations at the Central and State levels to ensure the welfare of senior citizens. However in the backdrop of changing socio-economic conditions, the effectiveness and efficacy of these laws have to be constantly evaluated. If found necessary, the legal provisions have to be re-visited and requisite modifications carried out. A robust legal framework implemented with vigour would help ensure the safety, security and well-being of elderly persons in our country. 8.The senior citizens too can play an important role in making their own lives fruitful and in enriching the society in which they live. By sharing their experience and wisdom, senior citizens can contribute towards the betterment of the society in no small measure. 9.With these few words, I conclude. 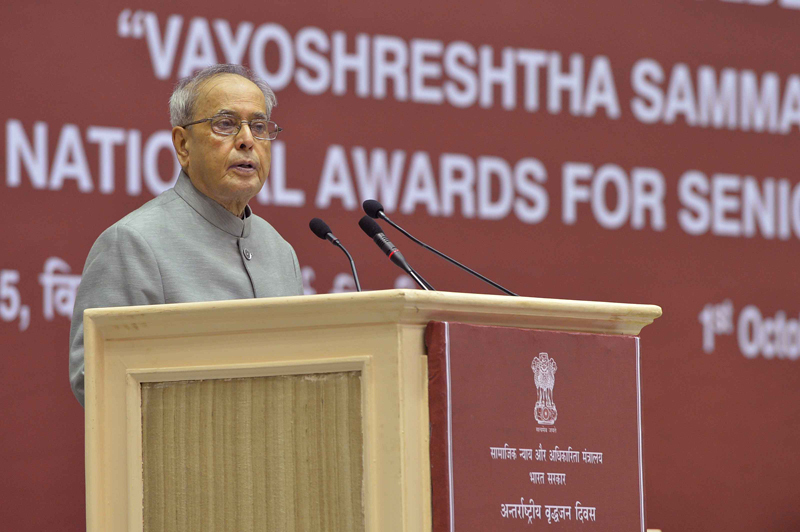 I once again offer my felicitations to all those who have been awarded with "Vayoshreshtha Samman" today. I wish all senior citizens of our society, particularly those who are present here, good health and happiness.